Facebook Live is an extremely powerful feature that is now available to everyone. You get the opportunity to directly engage with your audience, and Facebook is encouraging you to use their platform so you also receive great reach when compared to a simple page post. By taking the initiative can creating a video, you also now have an asset that you should use for more to reach all of your audience. 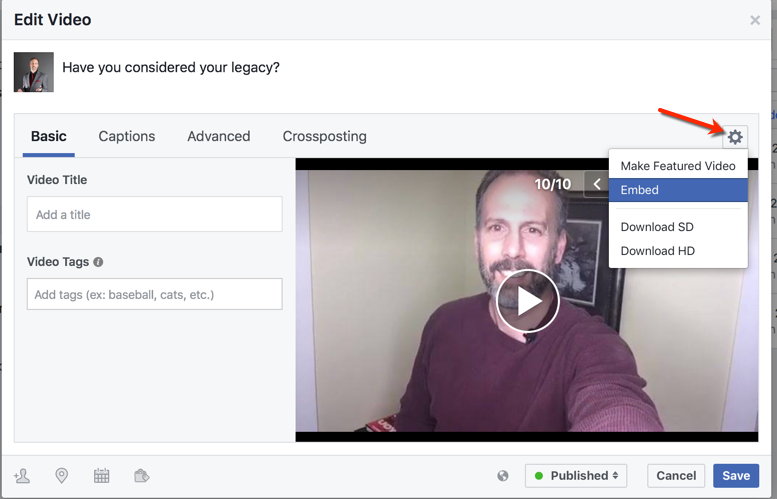 Here’s how to reuse that Facebook Video across multiple channels, with the steps (and screenshots) to download the video file from your Facebook account. Start by logging into Facebook.com and go to your profile. At the top menu, You’ll see a “More” drop down. Click that, and you’ll see a whole bunch of options. You’re looking for the Videos menu, which will open another window with all of your videos available. A new screen will come up with all the videos you’ve published on your page. The system by default will put you on the “Videos of You” screen. Click on the Your Videos, and you’ll see thumbnails for all your Facebook Live videos. Pick out the Facebook Live video that you want to work with. Put the mouse point on the thumbnail, and the pencil icon will show up. Click that. If you click on the thumbnail of your Facebook Live video, the video player will pop up on your screen. Click on Options (along the bottom of the video) and the download options are there as well. The choice is yours, but I would recommend the higher resolution just simply because it looks better if you’re using it on other channels. Once you click your Download option, your stand-alone video player will open. Right-click on the video and select Save Video As to save the video as an MP4 file to your computer. If your Facebook business page is live, here how to download your Facebook Live video from your page. You must be an authorized manager on the page to use these steps. 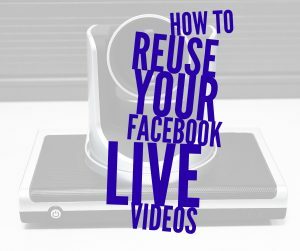 Once you have completed a Facebook Live video from your page, there are a couple of steps you have available to increase the reach of your video. First, log into the Facebook page you used for your Facebook Live post. Next, click on the Publishing Tools tab along the top. All of the Publishing Tools options will be displayed on the left side of your screen. Click on the Videos menu. The Video Library will be displayed. 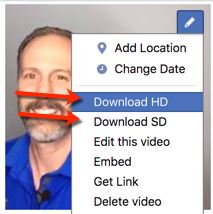 Choose the video from your Facebook Live session by clicking on the Edit icon. This will open the video editor, which is a pop up. Now you’re ready to download your video. Look for the gear icon above the top-right corner of your video’s image. Click the gear icon and select which version you want to download. Pick your choice, and the system will download a .mp4 of your Facebook Live video. Now that you have your video downloaded, it’s time to put this asset to work across all your channels. It’s great that your video post can reach far and wide on Facebook, but you can push that reach even further after the video has wrapped up. Here are 3 ways to expand the reach of this video. Create a blog post on your website with the video embeded. Upload your live video to YouTube. Send an email to your list, with a link to your blog post. Reuse of content is an important tactic. Every business owner has too many taskers to single purpose content. Start by creating a simple blog post with your subject, and embed your video into the page. Once you’ve downloaded your Facebook Live video, you can upload to to your YouTube channel. The objective here is to simply provide your content on multiple channels so that you can reach a wider audience. If you upload it to YouTube, you can even use YouTube’s simple video editing tools to trim your video down to the moment(s) you want to keep and share. Remember to add tags, and any other of the benefits of a YouTube channel to take advantage of your reach. Your live-streaming videos are an asset for your business. Reuse them across multiple channels, and you’ll expand their impact, grow your influence, and get more from this easy-to-create content. The step-by-step guide you need to get Local Business Facebook page up and running and bringing in leads. Is The “Next Class” Keeping You From Success? Previous Post [VIDEO] How To Increase Productivity And Stop “Being Busy” Next Post Is The “Next Class” Keeping You From Success?